Two telling articles recently appeared in the Chinese 'official' press. The first one was published in Qiushi, a theoretical publication of the Chinese Communist Party (and the Party School). It speaks of three major risks affecting China’s political stability. The first is: "the decentralization of power. The article argues that democratic political reform carries the risk of polarizing the power of the central government. The article cited Vietnam as an example." Practically, it means that there is no question of 'regional aspirations' or even a sort of federal system, like in India for example. It is far too dangerous for the Party which could explode (or implode). The second 'risk' is an economic one: "Fluctuations in the economy. Sustainable economic development and maintaining social mobility are fundamental guarantees of social stability in countries going through industrialization and modernization. Over the next 10 to 20 years, maintaining sustainable economic development and social mobility will be vital for China's social stability." The main objective of the recently-created Central Leading Group for Comprehensively Deepening Reforms (with Xi Jinping at the helm) is to introduce just enough 'economic' reforms to be able to maintain 'social stability' and save the Party from a Soviet-type end. Of course, there is no question of kejrivalisation in the Middle Kingdom, just minimum of reforms to avoid the Chaos. The third risk is 'losing control of the media'. The Qiushi elaborates: "Guiding social ideology, controlling public opinion, and managing social emotions are an important part of national governance and important ideological conditions for maintaining social stability. From the experience of other countries and the new situations has China encountered in recent years, the challenges and risks from the impact of social media and from the management of society's emotional impact are increasing." This explains the severe sentence inflicted on Xu Zhiyong, the pro-democracy activist. In November 2012, Xu had told The South China Morning Post: "For the world to become a better place, someone has to pay a price, I think it's glorious to sacrifice for the sake of social progress and fighting injustice." He did, he is now in jail for 4 years. Xu, 40, was a law lecturer at Beijing University of Post and Telecommunications when he founded the New Citizen movement in May 2012. His objective was to enhance social equality and to push for a fair legal system. According to the website Chinascope which translated the article, the author of the Qiushi article added that "it is foreseeable that social ideological guidance, the regulation of public opinion, and social emotional management will occupy a more important place in Chinese society in future governance and will play a greater role in maintaining social stability in the future." The second article, also translated by Chinascope is about the new Leadership Groups which will have more authority to crack down on 'special interest groups'. It first appeared in Consensus Network on January 26 and was later reprinted in the Qiushi Theory. 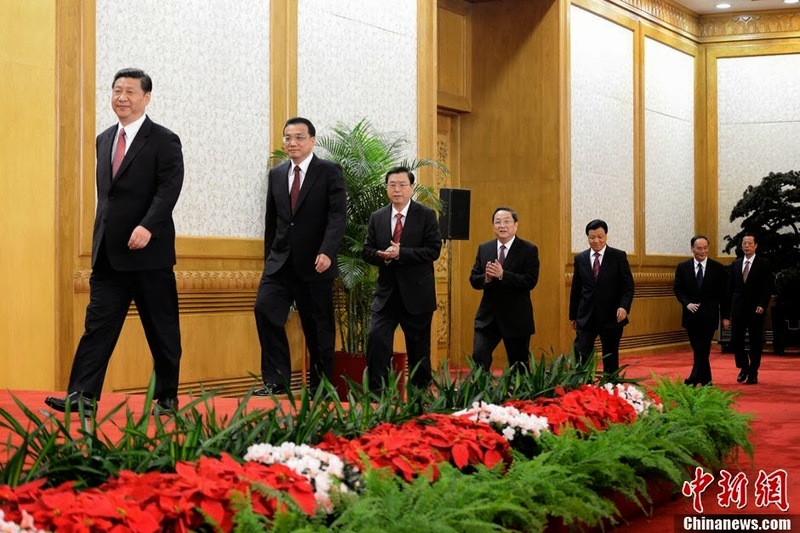 The article analyzed the new power relations between the CCP and the Government after the establishment of the Central Leading Group for Comprehensively Deepening Reforms and the National Security Committee. It explains: "As the Chinese Communist Party oversees the Chinese government, it is hard to distinguish whether the power is in the Party’s hands or in the government’s hands, but the two new leadership groups have a higher authority to crack down on special interest groups that were formed in the past." The fact remains that it is Xi Jinping, the Secretary General of the Party (and Chairman of the Central Military Commission) who is the boss of both Leading Small (in size) Groups. The article further states: "The new National Security Committee is responsible directly to the Politburo. It is chaired by the General Secretary and Vice Chairmen, representing the Party, the government and the National Congress. Its power is much greater than the US National Security Council. Therefore, the new power structure in China is a strengthened combination of the Party and the Government." Once again, what is worrying is that the two new Small Groups will yield more authority and will have the more means "to crack down on special interest groups". More repression against the Tibetans, the Ugyurs, the 'democrats' and others is in sight. The Horse Year starts on an ominous note. But can repression, always more repression help China to grow? Certainly not, though it is what the apparatchiks believe that it will. My article It’s not the last word on a First Lady appeared on the Edit Page of The Pioneer today. The Chinese are organized people, particularly, the Communist Party of China. For example, if they want to transfer a senior cadre to a less powerful position, either the person is kicked up to some grand-sounding position where he will hibernate or the Party organizes a foreign jaunt with stays in Five-Star hotels and ‘important’ meetings with foreign dignitaries. It is a sort of Golden Handshake. Has the French President learnt from the Chinese? Probably not, he has too many problems to think about with the stagnating economy and the increasing joblessness in France. However, the fact remains that the visit of the outgoing French First Lady is reminiscent of the Golden Jaunt. In the middle of the night, Valerie Trierweiler emerged from an Air France flight and disembarked at Chhatrapati Shivaji International in Mumbai where she was quickly whisked away in a waiting limousine. On her way to the car, she was ‘swamped’ by photographers. British ‘people’ magazine wrote about a ‘Princess Diana-style charity trip’, though she is neither a princess, nor a First Lady anymore. Her webpage has been removed from the official Elysee Palace website, her official Twitter account is inaccessible and her office at the Elysee is being been shut down. Her passage to India nevertheless raises serious issues. First, does France need a First Lady? It is for the French public (the Common Man) to answer this question. Bernadette Chirac, wife of former president Jacques Chirac, during a recent Europe I radio program found it ‘ridiculous’ that the wife (or partner) of the French head of state should be considered as the ‘First Lady’. In the past, French presidents’ wives (not to speak of live-in companions) never held this exalted status, although they would regularly accompany the President during his local and foreign trips. Well, that was long ago, before Kejrival era; but the guiding principles of the French Revolution and the triple mantra ‘Liberty, Equality, Fraternity’ were quite sound (that’s why they are still engraved in the Indian Constitution). True, the days of ‘Yvonne Aunty’, as the wife of Charles de Gaulle was affectionately known, are gone; we live now in the era of breaking-news and tweeting. In the West, large sections of the media only survive on spicy information forcing the rulers to adapt their image. The problem of Madame Trierweiler is that she has been the most unpopular resident of the Elysee Palace. Her famous tweet supporting a Socialist candidate battling against Hollande’s former partner Ségolene Royal made her loose the respect of Hollande’s four kids (with Royal) as well of the French public, not accustomed to this type of nasty outburst even during the ‘bling-bling’ Sarkozy days. 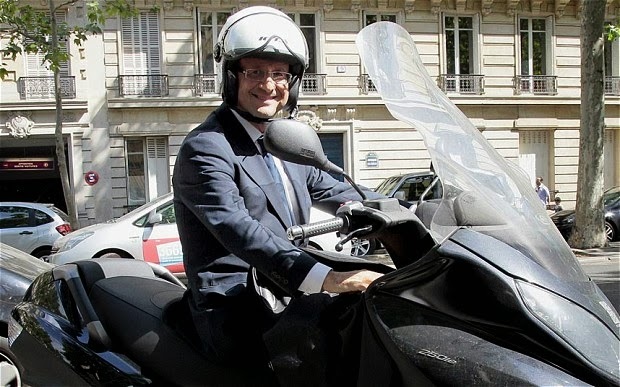 It is not that the majority of the French approve of their President’s scooter escapades to meet Julie Gayet, an actress who has been rumoured to be his ‘partner’ for a couple of years (the ‘First Lady’ was undoubtedly in the know). The details of the story delighted a British press, (French bashing is an oft-indulged sport on the northern side of the Channel) and l’Affaire Gayet was one of the rare occasions when personal stories splashed on the front pages of even serious French newspapers. French politicians’ private life is not usually made public (President Francois Mitterrand could have a decades-long affair and even an ‘illegitimate’ daughter without anybody bothering). Trieweiler’s jaunt brings forward a more serious question about the image of India, a country not doing enough for nutrition and poverty. The former French President’s companion came to India for a ‘charitable’ purpose, to promote an aid group ‘Action Against Hunger’. She was seen cuddling and kissing children in a pediatric ward, thus projecting a ‘poor India’ where children are starving. My questions are: does India need her children to be saved from hunger and poverty by foreign NGOs? Does India not have enough resources to look after her own kids? How can a mediatized first class trip to Mumbai, with a stay in a Five Star hotel help solve the issue of hunger or poverty? It clearly cannot, though it will certainly bring some publicity to the organizers. The real issues are: if only 50% of the grants allotted under different Government schemes would reach their target, poverty would certainly disappear. What about Indian funds hidden in Swiss coffers? If repatriated, it would make a huge difference. If Mrs Trierweiler is keen to experience ‘misery’, she should visit the ‘banlieux’ (the suburbs) of Paris or other large French towns, she will meet true poverty there; she should remember that nobody in France has the means to book Versailles Palace for a wedding, like a rich Indian did a few years ago. To make it worse, the event was organized by another French actress Charlotte Valandrey involved in promoting organ donations and transplants. To mix ‘poverty’ and organ donation in India is indeed in bad taste, especially when sponsors include the Champagne brand Moet and Chandon. We are living in a strange world, on one side we have a ‘kerjivalisation’ of the society, in which the Common Man is King and can do whatever he feels is right and on the other is the ‘peoplelisation’ of the world where only the rich and the beautiful attract the attention of the media. Where to grasp for fresh air in between? It is of course wrong for the French Presidency to mix private and state affairs, but moralists have never solved any problems. In India too, there is a tendency to make fun of Hollande’s sentimental misadventures, one usually forgets that Nehru’s relation with Edwina Mountbatten cost India a large chunk of J&K State. But that is secret! By the way, after her stay in the hospital (following the revelations of Hollande’s affair), the former ‘First Lady’ spent a few days at the presidential retreat in Versailles. Before the Revolution, the place used to be a hunting lodge, known as La Lanterne. Unfortunately, it has a strong Revolutionary connotation, the sans-culottes would sing ‘les aristocrates à la lanterne!’ (‘the aristocrats to the lamp lost’ or ‘Hang 'Em High’). Francois Hollande should think of changing the name of the retreat, the days of ‘hanging’ are no more. In the meantime in China, Xu Zhiyong, the activist of the New Citizens Movement has been sentenced to four years behind bars for public order offences. He was found guilty of ‘gathering a crowd to disturb public order’; he had wanted ‘social justice’ and advocated ‘transparency’. This is not well seen in today’s China. Indeed, we are living in a strange world. My article China pushes Yu Zhengsheng out of security plan appeared on Monday in NitiCentral. An article in China Tibet Online tells us, 'Safe water available for locals in Tibet's remote county'. Since when Rutok County (Dzong), this remote area east of Ladakh is polluted? 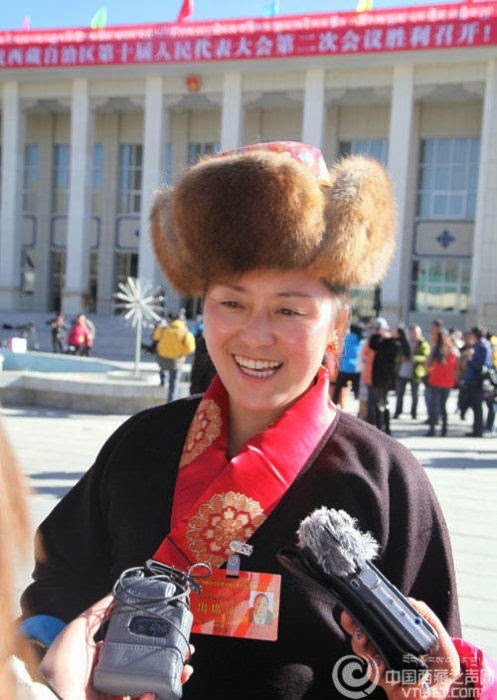 Quoting The Tibet Daily, the reporter explains: "The Rutok County in the remote Ngari Prefecture in western Tibet, has access to safe drinking water in [since?] 2013." Is the Indus river flowing not far away polluted too? What about the beautiful Panggong Tso, located some 15 km from Rutok town (Rutok is also the name of the County, Rutok Dzong)? The article affirms: "The Rutok County has achieved the goal of providing safe drinking water, which has benefitted 1,860 farmers and 277 faculty members and students. Moreover, the livestocks in the rural area also got access to the drinking water last year." Wikipedia thus describes Rutok: "It is the seat of Rutok County in the Ngari Prefecture. It is located 126 kilometres by road northwest of Ngari [town]. The town has a population of about 1000 people. Older reference works give the name as Rudok. 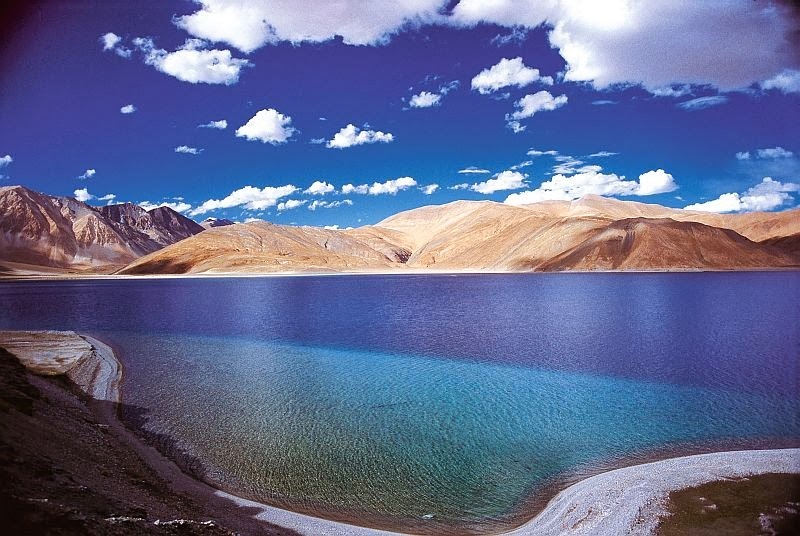 It lies approximately 10.5 miles east of Zhabsang near Panggong Tso [lake]. 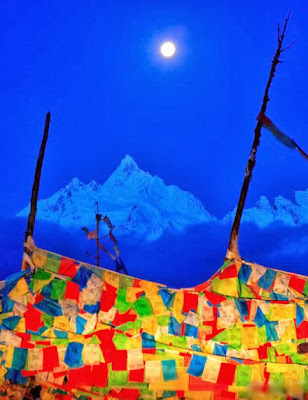 ...Rutok is a small town on the Ladakh frontier of Tibet, close to India. Rutok is picturesquely situated on the side of a hill standing isolated in the plain near the east end of Lake Panggong in Ladakh." Historically, Rutok was the seat of the Garpons, the Governors of Western Tibet. For centuries, nomads from Tibet and Ladakh have sent the herds grazing around the salted lake, did they know that the rivulets flowing in the lake was 'unsafe'? Now, it appears that the local government has drilled over 300 wells "to solve the problem of shortage of safe drinking water". The Chinese have invested some 2.42 million yuan (400,000 US $) in the project. 'Safe drinking water' has also been provided to the Lhundrup Choden Monastery, costing 574,000 yuan (95,000 US $) to the Chinese exchequer. The article does not mention the PLA garrison posted nearby. Are they drinking 'safe water'? If this article is to be believed, one of the most pristine regions of the world is now polluted? Why? Perhaps too many migrants sent from China? Nothing is logical in the Middle Kingdom. Yu Zhengsheng, No 4 in the Standing Committee of the CCP's Politburo is normally considered as the leader in charge of the country's (restive) minorities, as well as Taiwan. One could have thought that he would have been a pillar of the new National Security Commission (NSC) which will oversee, coordinate and monitor the country's foreign policy as well as the domestic and defence issues related to security. Today in China, one of the major 'security' concerns is the restiveness of 'minorities' areas such Tibet and Xinjiang. Let us not forget that Mr. Yu is Chairman of both Central Working Coordination Small Groups on Tibet and Xinjiang; he is also responsible for the relations with Taiwan. Incidentally, Yu Zhengsheng yesterday chaired the annual Taiwan Work Conference in Beijing where he called for concerted efforts from all levels of government to develop cross-strait relations and discourage the island from declaring its independence. Yu even pleaded for renewed 'civilian-level' political dialogue in order to reach Beijing's objective, i.e. the cross-strait reunification. Though responsible for these important security issues, Yu will not seat on the National Security Commission with his colleagues of the Standing Committee. President Xi Jinping will be the chairperson, while Premier Li Keqiang and the Chairman of the National People's Congress, Zhang Dejiang will be deputy chiefs. A Politburo statement said that the commission will be responsible to "make overall plans and co-ordinate major issues and major work concerning national security". The NSC should directly report to the Politburo and its Standing Committee. President Xi, who will also chair the new Leading Small Group on Reforms had earlier declared: "Ensuring [the party's] political safety and political power will be the primary tasks facing the National Security Commission," adding that the NSC would help deal with threats at home and overseas. The South China Morning Post commented: "Observers wondered where it would sit in the state power structure and how it would align policies across the various intelligence, military and foreign affairs departments". Why Mr. Yu is not part of it is a mystery (to me at least). Xinhua had reported that Yu pressed for a political reunification with Taiwan: "All departments all over the country must steadfastly and wholeheartedly push for stable development of cross-strait relations, continue to promote cross-strait political mutual trust and interaction, while resolutely opposing any separatist attempt of Taiwan independence." 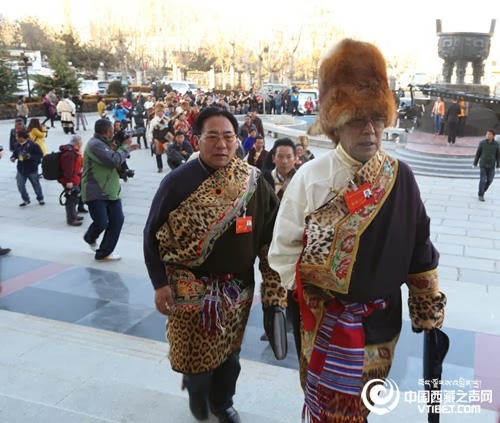 In the meantime, the regional CPPCC and People's Congress met in Tibet and decided to "strive to do a good job on people's livelihood... the starting point and foothold of all work". 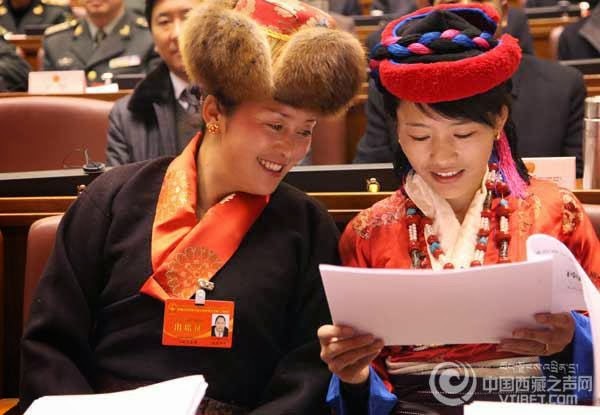 Accordingly the Tibet Autonomous Region's Government decided to implement a series of policies on people's livelihood "so that people of all nationalities can feel the warmth of the party and the government". To improve the basic cost of living allowances of low income people in urban and rural areas. For rural residents, the basic living allowance is improved from 440 yuan RMB (US $ 74) to 490 yuan RMB (US $ 80). For rural residents, it increases from 1750 yuan RMB to 1950 yuan RMB. To improve fiscal subsidy standard of medical system in agricultural and pastoral areas. The subsidy increases from 340 yuan RMB to 380 yuan RMB per person per year. To improve the fiscal subsidy standard of new rural social pension insurance. The subsidy increases from 105 yuan RMB to 120 yuan RMB per person per month. To improve the fiscal subsidy standard of basic medical insurance for urban residents. The subsidy increases from 300 yuan RMB to 340 yuan RMB per person per year. To improve the treatment of village doctors. It increases from 300 yuan RMB to 600 yuan RMB per person per month. To improve the basic compensation standard of epidemic prevention coordinators at village level. To improve the preschool subsidies, 'three guarantees' (namely eating, living, and studying fees) for herdsmen's and farmers' children who are receiving education from compulsory education to high school period, and student subsidies standard for poor children in urban areas. 200 yuan RMB are added on the basis of the original level. To improve the basic payment and performance evaluation standard of village cadres. To improve the living allowances standard of Senior party members, veteran cadres and old model workers. It increases 50 yuan RMB per person per month. To improve the support subsidy standard of rural residents enjoying 'five guarantees'. It increases from 2600 yuan RMB to 2900 yuan RMB per person per year. To distribute the living subsidy to staff in village and township authorities and public institutions in Tibet Autonomous Region. Will these few dollars more drastically change the situation on the Tibetan plateau? Will 'common folks' start feeling the warmth of the Party? It is doubtful; the tensions, the resentment is bound to continue. It is all the more surprising that Mr. Yu has been side-lined and not made part of the National Security Committee. Tibet and Xinjiang are indeed serious 'security' issues for Beijing. China Tibet Online informs us that the People's Liberation Army's soldiers guarding the border with India, can finally sleep. 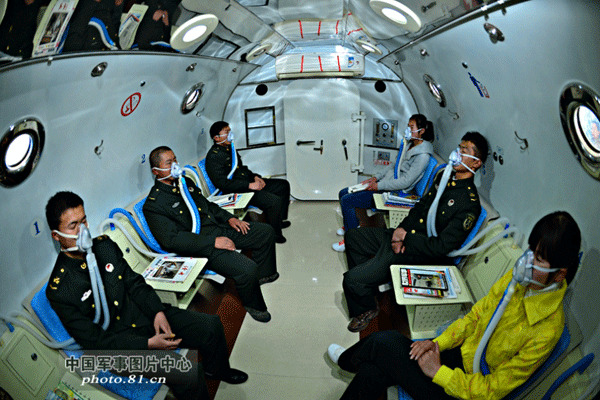 The Chinese publication writes: "Oxygen chamber benefits soldiers in Tibet". It explains how: "At a border station of an altitude of 4,700 meters high in Lhoka Prefecture of SW China's Tibet Autonomous Region, a border guard was interviewed newly after his sleep and he told the reporter: 'I've been in the border army for 7 years, but last night I slept much better than ever before'." Lhoka is the area north of the McMahon Line, opposite Arunachal Pradesh. Though border guards are usually not supposed to sleep, in this case, they are probably aware that India is a peaceful neighbour. India is indeed not the reason to their sleepless nights. The caption of the photo accompanying the article reads: "Border soldiers and their spouses are experiencing the hyperbaric oxygen chamber treatment". The reporter continues: "Thanks to the hyperbaric oxygen treatment newly adopted at the No. 41 Hospital of the PLA, he [the interview frontier guard] is not the only one benefiting from a sound sleep after treatment." According to Wikipedia: "Hyperbaric medicine, also known as hyperbaric oxygen therapy (HBOT), is the medical use of oxygen at a level higher than atmospheric pressure. The equipment required consists of a pressure chamber, which may be of rigid or flexible construction, and a means of delivering 100% oxygen. Operation is performed to a predetermined schedule by trained personnel who monitor the patient and may adjust the schedule as required. HBOT found early use in the treatment of decompression sickness, and has also shown great effectiveness in treating conditions such as gas gangrene and carbon monoxide poisoning." The Chinese article asserts: "In the past, due to the plateau hypoxia, border guards in Tibet could barely manage to sleep more than 3 hours after returning from holidays from inland China as their bodies were in need of readjustment to the thin air in Tibet. The symptom usually gets worse in the winter. Due to the lack of sleep, many soldiers have suffered from immunity drop, agitation, hair loss and other symptoms." We are now informed that to 'crack the hard nut', a hyperbaric oxygen chamber has been installed to help the soldiers to adapt to the anoxic environment. The new equipment was introduced in May 2013. It is said that soldiers (and their spouses), who suffer from high altitude pulmonary edema, sleep disorder or just back to work from inland cities are free to use the chamber. The Indian jawans will be jealous to discover that the border areas in Tibet is a family posting. More seriously, last year, I posted excerpts of a fascinating document which exposed the psychological trauma faced by the People's Armed Police (PAP) in Tibet. 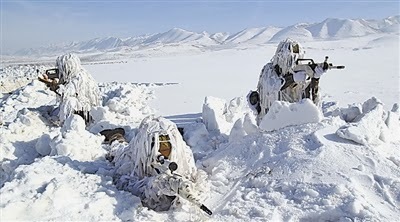 Do the PLA troops face similar difficulties? One solution for the PLA leadership would be to employ local personnel, but the Han bosses probably do not trust (perhaps rightly) the Tibetans. Is Beijing getting closer to the Dalai Lama? Reading a recent article entitled 'High-end dialogue: ancient Buddhism and modern science' published by China Tibet Online, it is the impression that one gets. The Chinese publication reports: "An academic dialogue themed 'Buddhism and Science' was held in Beijing last weekend, discussing about the similarities between Buddhism and modern science." The convergence between Science and Buddhism has been the Dalai Lama's pet project for 2 decades now, as can be seen from my article posted below (written more than 3 years ago). China Tibet Online explains: "Three honored guests attended the crossover, including Zhu Shiqing, academician from Chinese Academy of Science, Janye Lekdrup Rinpoche, a major living Buddha from the Jonang Sect of Tibetan Buddhism [never heard his name before], and Professor Shen Weirong, a scholar of religious studies from the Renmin University of China, the event's organizer." It is interesting that Communist China has started this type of dialogue. As the Chinese website put it: "The dialogue pointed out that natural science - modern fundamental physics in particular - had developed beyond humans' sensorial reach and derived many subversive notions to traditional and classical physics." It quotes a scholar Zhu Qingshi saying: "More and more newest achievements of physics become similar and tally with the core ideas of Buddhism," while Janye Lekdrup Rinpoche affirmed: "Buddhism has many aspects including science, philosophy and art, and religion of course. Yet, the essence of all is to explore and verify absolute reality, and all aspects are actually ways and methods to this end." Professor Shen Weirong admits that in the West, this dialogue between religion and science has a long history: "the crossover between Buddhism and science has become a hot topic in the academic and cultural circles", adding: "The dialogue between Buddhism and Science has a profound historical and cultural background and a practical significance to academic research." The 'dialogue' was organized by the China Tibetology Research Centre, and the Buddhist Cultural Centre in Beijing. The next stage is a 'scientific' exchange between the Dalai Lama and top Chinese scientists (why not start by neuroscience?). It would perhaps help break the ice between Xi Jinping's regime and the Tibetan leader. A few Chinese scientists could be invited in Dharamsala (or Delhi or elsewhere, if it is easier for Beijing) to discuss these serious issues for a few days. ...The Dalai Lama would like to give more time to the exploration of a convergence between science and spirituality. In an era when religions tend to divide people, with each believer quoting his own dogmas or sacred scripture, the Dalai Lama is a firm believer that all the religious traditions and texts need to be ‘tested’. It is why the Tibetan leader initiated a dialogue between science and spirituality last week in Delhi. 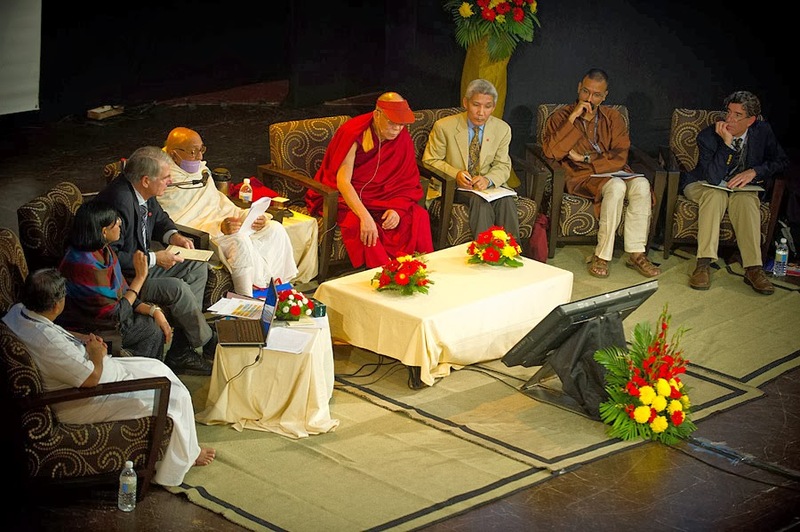 The Contemplative Science Conference was organized by the Mind & Life Institute from the United States and the Foundation of Universal Responsibility based in Delhi; The National Institute of Advanced Studies, Bangalore, and the Central Tibetan University, Sarnath also participated. The entire initiative is the brain child the Dalai Lama who has been meeting reputed scientists for the past 25 years to see if the effects of meditative practices can be corroborated by modern science. The ‘testing’ process may not be important for the practitioners themselves; the Dalai Lama recounted the story of the yogis living in caves who were not at all interested in being covered by electrodes to ‘test’ their siddhis or meditative prowess. He however believes that it is important for the rest of humanity to realize that exercises such as yoga or meditation can bring peace of mind and ultimately a better life for those practicing it. He sees it as a gift from India and Tibet to the world. For skeptical westerners and ‘educated’ Indians, the validation process remains important. The main theme of the Conference was ‘the emerging field of Contemplative Science which can investigate the effects of contemplative practice on human biology and behaviour’. But exactly is this Contemplative Science? Apart from world famous scientists such as Richard Davidson, the world famous brain scientist, Daniel Goleman, author of Emotional Intelligence, former President APJ Abdul Kalam and renowned yogacharya B. K. S. Iyengar provided valuable inputs. Though modern science is in its infancy compared to the inner sciences of India or Tibet, this is a fascinating process. The fact that the modern religion called ‘science’ has agreed to investigate the powers and complexities of the mind (and the body) is a great step forward for humanity and one should be grateful to the Dalai Lama for instigating this initiative. The Tibetan leader appealed again and again to Indian scientists, philosophers or yogis to take the lead on the old new path. He mentioned several times the Nalanda tradition. At a time when the Government of India plans to revive the Great Vihara under a political appointee who unfortunately does not have the vision to give a lead to this project, this conference was like the first step towards a new Nalanda, the holistic and ‘secular’ learning center per excellence. In his opening speech the Dalai Lama explained: “[In Nalanda], there was an emphasis on investigation. Great masters like Nagarjuna, Dharmakirti, Aryadeva, Chandrakirti and others were great teachers of Nalanda monastic [university]. They followed Buddha’s word, they investigated, ‘is the content of this verse acceptable or not’, at the end everything was decided by analysis and reasoning. At the beginning [of each Nalanda text] there are four indications: the purpose of the text, the subject-matter of the text, the benefit of this text and finally the relations between them,” he explained. These great teachers like the Buddha before them always emphasized “the readers should not accept right away what the text says”. The Tibetan leader affirmed, “you should be sceptical and analyze, investigate. Only after [deep analysis], you can understand the text, then you can really get the benefit”. To conclude he quoted Buddha again “my followers should not accept my teachings out of faith and devotion, but after investigation and experimentation”. In today’s violent and disturbed world, one can understand the immediate repercussion of these words. At a time when intolerance generates conflict and terrorism all over the planet, the message of Nalanda is all the more crucial. If each religion of the world could be convinced that ‘their’ truth, ‘their’ scripture need to be investigated before starting a war to defend them, the world would be more peaceful. It was a great privilege for this writer to listen to eminent scientists, monks, scholars and yogis dreaming of a confluence of science and spirituality. Only the Dalai Lama has today the moral authority to initiate such a fascinating and futuristic process. Many today in India believe that beating the Chinese at the GDP Game is the ultimate objective of the Nation, but if the Spirit of Nalanda could blow again over Asia and the West a much more radical step in Evolution could be taken. It is why the Dalai Lama matters and if the Tibetans can relieve him of some of his responsibilities, it is better for humanity. In 1914, Sri Aurobindo saw for India that: “The recovery of the old spiritual knowledge and experience in all its splendour, depth and fullness is its first, most essential work. The flowing of this spirituality into new forms of philosophy, literature, art, science and critical knowledge is the second. One can just regret the ‘body’ has not been included in the Mind and Life studies. Body has for too long been neglected in India. The Ancient Rishis knew the prowess and importance of the material sheath for spiritual realizations. The presence of Yogacharya Iyengar was however a good step in this direction. My article on the extension of the Lhasa railway line to the Indian border, India’s nightmares over Chinese bridge on Yarlung Tsangpo river appeared in NitiCentral. It is the most strategic breaking news of the year. China has officially announced that the construction of the Lhasa-Nyingtri railway line will start in 2014. For India, it is an extremely serious (though expected) development. Indian Army Chief Bikram Singh has just admitted some 'inadequacy' in the road and rail infrastructure along the borders with China, while assuring the Indian public that "the government is working to build the facilities there and has identified projects". During his press conference, General Singh stated: "Only last year, the Centre had allocated Rs 9,200 crore for infrastructure along the borders with China and a Cabinet Committee on Security note had been prepared for another Rs 28,000-crore worth of projects for the 12th and the 13th Five-year Plans". Too little, too late, to counter China: the Chinese train will soon reach India’s north-eastern border, close to the McMahon line. On January 10, 2014, Lobsang Gyaltsen, the Chairman of the Tibet Autonomous Region (TAR) announced the forthcoming laying of the railway connecting Lhasa and Nyingtri Prefecture. 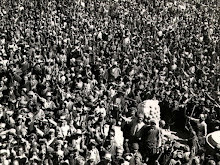 Gyaltsen made the announcement while presenting his government ‘work report’ to the Tibet Committee of the Chinese People's Political Consultative Conference in Lhasa. He asserted that the Lhasa-Nyingtri railway was right now at the feasibility study stage, with two designs leading southward and northward being under consideration; he explained that the new line will be the second extension of the Qinghai-Tibet Railway. The first one is the line from Lhasa to Shigatse, the second largest Tibetan city; it is scheduled to be opened before the end of the year. And in China, a ‘few months’ means a ‘few months’ and not a ‘few years or decades’ like in India. In September already, the same official promised a Nepali delegation visiting Tibet that Beijing would extend a rail service to Nepal, once Shigatse line is operational. The Nepali delegation had also requested China's help for the construction of a line from Kathmandu to Lumbini, the birthplace of the Buddha near the Indian border. The Tibetan leader kept mum on the latter; the decision being probably out of his limited jurisdiction. The last hurdle to Shigatse was cleared by crossing the Yarlung Tsangpo (Brahmaputra), near Shigatse: “The track-laying of the Lhasa-Shigatse railway has spanned the Yarlung Tsangpo River for the first time on September 24, 2013,” had announced Xinhua. The Lhasa-Shigatse 253 km long railway started in 2010. The railway passed through one of the canyons of the Yarlung Tsangpo which is nearly 90 km long. With its 13 stations, the train which will be moving at 120 km an hour and will be able to carry an annual freight of 8.3 million tons. The next stages on the drawing boards are Nepal and Nyingtri. Then Nepal will no longer be an enclaved country, depending on India to survive and the border of the sensitive Arunachal Pradesh (claimed by China) will be reached. While delivering his ‘work report’, Lobsang Gyatsen mentioned the Party's four 'achievements' for 2013. He listed Beijing’s financial support in agriculture which reached 2.5 billion U.S. dollars and a 15% increase in education subsidy. However, the most important work was undoubtedly the 117-km highway linking Metok, ‘the last roadless County in China’; it was formally opened to traffic on October 31, 2013. 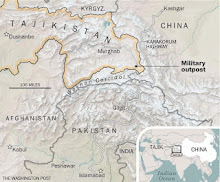 Though it cost a whopping 155 million U.S. dollars to the Chinese exchequer, for the People’s Liberation Army (PLA), it was strategically worth opening up this remote border area. This infrastructure development is in fact a smart investment. Gyaltsen admitted that Tibet received 13 million tourists in 2013 (400,000 more than the objective set by the Chinese Government) and 20 % more than in 2012. This last achievement earned 2.5 billion U.S. dollars in revenue. Selling the Land of Snows to the Han tourists is good business. 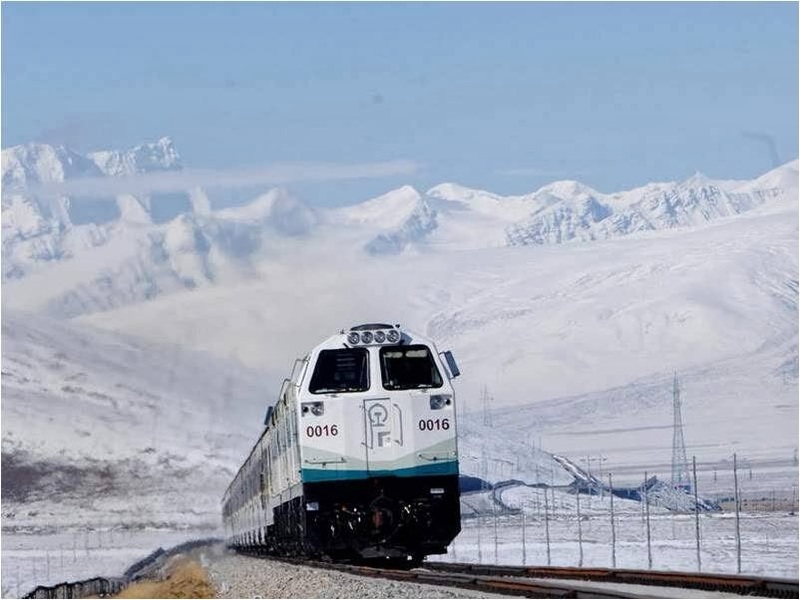 In a not-distant future, when the train reaches Nyingtri Prefecture, the area will become one of the two main tourist 'hubs' on the plateau (with Lhasa). You will not believe it, but mass weddings of Han Chinese are already celebrated there; tourists come from the Mainland to party in this 'paradise on earth' for Valentine Day and the Brahmaputra gorges attract tens of thousands of Chinese tourists. Xi Jinping, then Vice-President, himself visited the ‘paradise’ in July 2011. His visit was important because Xi is also the Chairman of the Central Military Commission and in the past, he advocated following Chairman Mao’s theory known as “the synthesis between the requirements of peacetime and war.” In other words, civilian infrastructure projects such as roads, airports and railways should be designed to also serve war-time needs (with India, in this particular case). The main technical hurdle was solved when a tunnel to Metok was opened in December 2010 (at the time of Premier Wen Jiabao's visit to India). Another bird may be killed with the same stones (the road to Metok and the train to near Nyingtri), the new developments may allow the Chinese engineers to draw the plans for a mega power plant in the Great Bend. 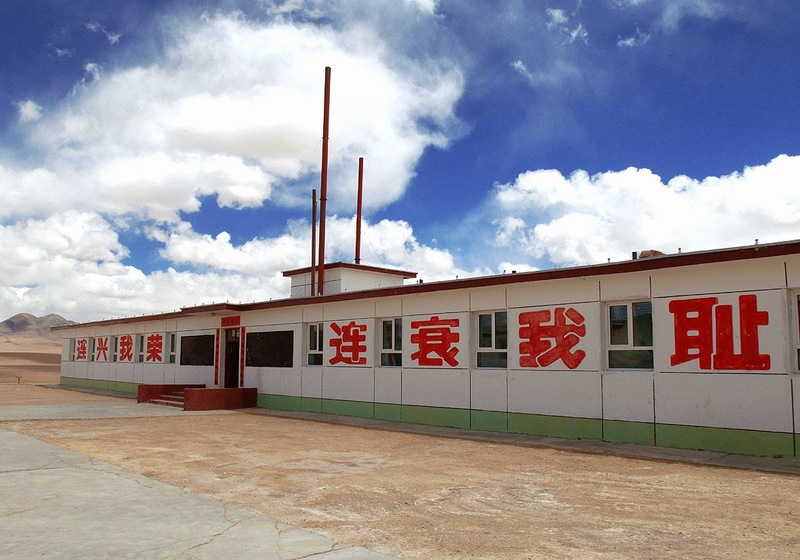 And let us not forget that Bayi, located nearby in Nyingtri prefecture, (not far from by the Airport too), is the PLA’s main military 'hub' in Tibet. It is an ideal place for the People's Liberation Army (PLA), just a few kilometers north of the McMahon Line. It will soon be served by a railway line. Bayi is a PLA town; ‘Bayi’ means 'Eight-one" or 'August 1' referring to the anniversary of the Nanchang Uprising, considered to be the founding date of the People's Liberation Army. The name of 'Bayi' is 'copyrighted' by the PLA which is alone entitled to use it for important militarily projects/bases. The town of Bayi in Nyingtri Prefecture was established soon after the invasion of Tibet by the 18th Army (part of the Second Field Army based in Sichuan) in the early 1950s. It is today one of the two main PLA bases in Tibet, coming under Chengdu Military Region. A few days ago, Lt Gen Sanjiv Chachra, the new GOC-in-C, Northern Command told reporters after his investiture at Akhnoor, near Jammu: “our aim for the next year is to ensure that our infrastructure and capability building, including construction of road network and habitats come up so that we have a reasonable position." What is a ‘reasonable’ position when China is decades in advance? My article on the two recent fires in Tibet appeared in The Statesman today. Two recent mishaps in Tibet highlight the new policies and trends on the Tibetan plateau. First, a huge fire broke out at the Serthar Tibetan Buddhist Institute in Larung Gar in the Kardzse (Garzi) Tibetan Autonomous Prefecture of Sichuan Province. The fire was reported at 7.30 pm on January 10 and it continued during the entire night. Serthar is not an ordinary place of Eastern Tibet. Remember 2001. 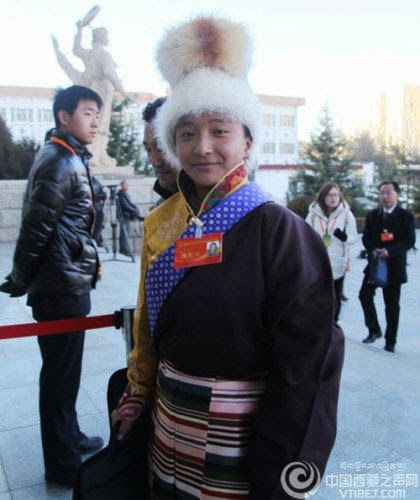 At that time, reports poured in that Beijing had decided to expel thousands Tibetan nuns and monks from the Institute. The State wanted to tighten its grip on religious centres; the presence of many Chinese Buddhists had become 'subversive' for the Chinese State. The South China Morning Post had then written: "Tibetan support groups and Chinese residents of a nearby town said the dismantling of homes at Serthar had started in June  and many of the residents — once estimated at 6,000 to 7,000 — had been forced to leave." Beijing’s objective was to reduce the size of the community to about 1,000 monks and 400 nuns by October 2001. The Institute was founded by a charismatic Lama, Khenpo Jigme Phuntsok in 1980 to help revive Buddhist scholarship and meditation. The increasing number of Chinese students posed a serious ideological problem to Beijing. A year later, a serious row erupted over reconstruction of the Serthar Institute. The Tibetan Centre for Human Rights and Democracy (TCHRD) based in Dharamsala had received reports that a serious scuffle between nuns and Public Security Bureau’s officers from Kardze occurred on 25 December 2002. 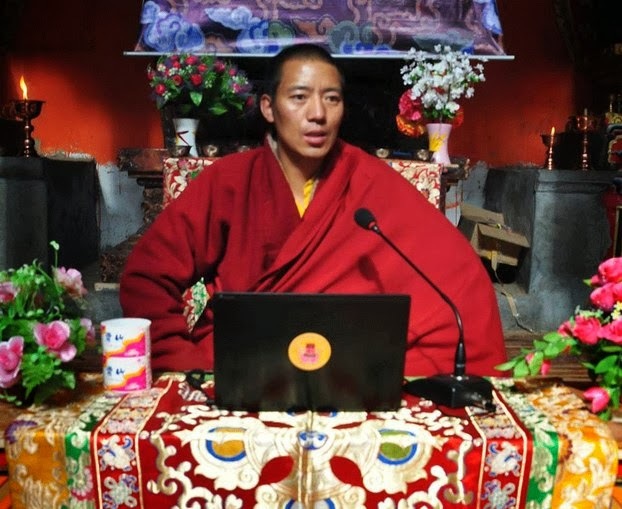 At the time of the incident, Khenpo Jigme Phuntsok was undergoing a medical treatment in a hospital in Barkham County (Sichuan). Though the Khenpo passed away in 2004, in the very recent years, the Institute has been rebuilt. Between 10,000 and 40,000 monks and nuns are said to live and study today in Larung Gar, the figures vary depending on the sources. The Communist Party seems to have selected this location (outside the Tibetan Autonomous Region) to allow religious practice to 'flourish', while the experience is carefully monitored by the authorities. Now the Serthar Institute has been ravaged by fire. The South China Morning Post reported: "The blaze destroyed more than a dozen buildings, which some reports said were living quarters for student monks or nuns. No casualties have been reported as yet. Authorities are still investigating the cause of the fire." 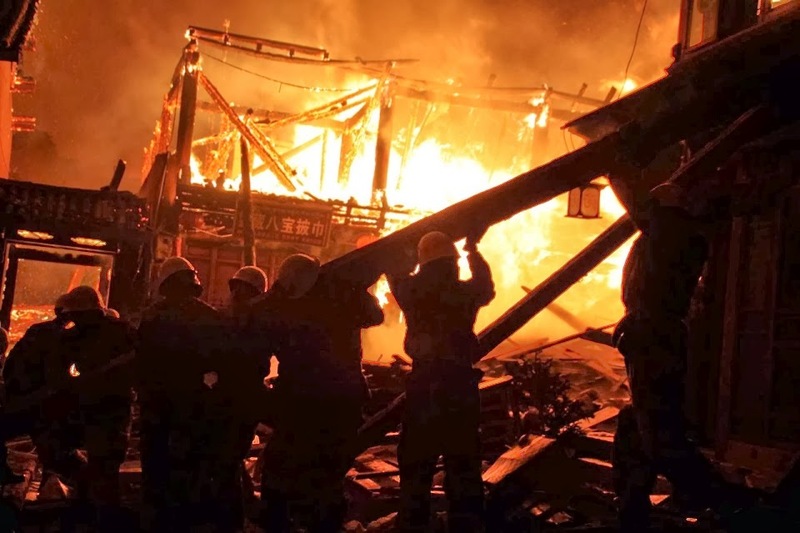 It is said that some 450 people joined the rescue operations; the microblogging site, Weibo showed people in uniforms as well as monks walking through the debris with the fire raging in the background. This is one aspect of Beijing’s policy for the Tibetan plateau: to allow a degree of ‘spiritual’ freedom, while keeping a close tab on the activities of the Institute. 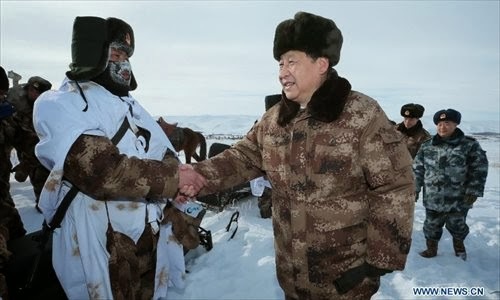 The other aspect of the Party’s ‘Tibet Policy’ is the ‘disneyfication’ of the Land of Snows, making Tibet a giant amusement park into which millions of Han Chinese tourists can be poured. No place symbolizes more this policy better than Shangri-la County in Yunnan Province. Here too fire broke out. Hundreds of firefighters, soldiers and volunteers finally managed to extinguish the blaze by late morning. Luckily, no casualties or serious injuries were reported. According to Xinhua, the fire destroyed 242 houses, a quarter of the old town today entirely devoted to tourism. Previously called Zhongdian, the Chinese authorities use the name of the mythic paradise from James Hilton’s novel, ‘Lost Horizon’ to promote tourism in the area; a good marketing trick. The authorities believe that it is unlikely the blaze was deliberately started; Xinhua said that the possibility of arson has already been ruled out, though an investigation is still under way. Suspicions arose after some local people questioned the slow speed of the response of emergency services. These two fires have a common feature, they symbolize the 'New Dream Tibet' (or Tibet with Chinese characteristics) envisaged by Beijing. Shangri-la is one of the main sites planned for the 'Tibet holidays’ campaign. As a result milions of Chinese visitors rush every year to Tibet in search of exoticism, clear sky and fresh air; a touch of spirituality is even added by using the name 'Shangri-la'. Why should these two symbolic sites of 'New Tibet' burn at the same time? Probably a coincidence! Xi sees China's 'traditional cultures' or faiths such as Confucianism, Buddhism and Taoism could help fill a void which has helped corruption to flourish. 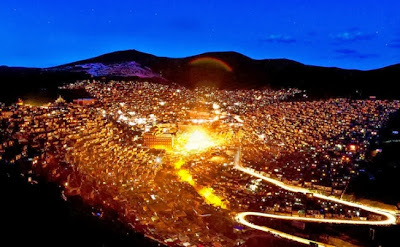 This explains the grand revival of ‘spirituality’ in places such Larung Gar; by bringing millions of tourists in Tibet, the Communist Party believes that it can alleviate the poverty of these remote areas and give a boost to the traditional Tibetan culture (which is of course, sinicized in the process). Incidentally, though it has no direct connection with the blazes, Li Chongxi, a Communist cadre who served in both Eastern Tibet’s 'burning' places (in Kartse in 1995-96 and Aba in 1996-2000) and later became one of the most powerful officials in Sichuan, has been sacked. Li was close to the former security tsar Zhou Yongkang; for Xi Jinping, Li probably represented the old approach to the Tibet question, namely repression and corruption. According to the Chinese media, Li has got the boot after being suspected of corruption. It is also seen as a move against people close to Zhou, himself under graft investigation. Citing a statement from the Communist Party’s powerful Organization Department, Xinhua added: "Authorities are investigating his case according to procedure”. Li Chongxi was the chairman of the provincial committee of the Chinese People's Political Consultative Conference. He is the third senior official from restive Sichuan who fell ‘under suspicion’ in 2013. A last story about 'fire': the great Indian Guru Padmasambhava, who propagated Buddhism in Tibet during the 8th century, is said to have been able to set on fire the robe of the Chinese Emperor, just by reciting powerful Sanskrit mantras. For whatever reasons, both these mishaps have had a 'miraculous' end, no casualties were reported in Larung Gar or Shangri-la; however one may soon realize that the emperor’s new clothes (i.e. policies) have burnt. Operation Blue Star is again in the news. Some documents recently declassified in UK would suggest a participation from MI-6, the British secret service in the preparations of the operation to flush out the Sikh insurgents from the Akal Takht. Prime Minister David Cameron told the Parliament that there was no evidence so far to suggest that elite British special forces played a role in the 1984 Operation Blue Star: "I don't want to prejudge the outcome, but I would note that so far it has not found any evidence to contradict the insistence by senior Indian army commanders responsible at the time that the responsibility for this was carried out solely by the Indian army." Late B. Raman, who was then responsible for the 'khalistani terrorism' in the Indian external intelligence agency, wrote in his Kaoboys of the R&W: "I was given to understand that at the request of [RN] Kao [R&W Chief], two officers of the British Security Service (MI-5) visited the Golden Temple as tourists and gave a similar advice to Indira Gandhi—- be patient and avoid action or use the police." In 2004, I wrote an article on another aspect of the Blue Star Operation. I had given the article for publication, but later withdrew it when I was informed by a senior Tibetan official that it was not fully factually correct. Though the Special Frontier Forces (SFF) did participate to the OP Blue Star, it is not Tibetan jawans, but Nepalis who were present during the assault. The Establishment 22, as the SSF is known, had recruited Nepalis in the Force and for reasons that one can understand, the Tibetans were not sent to Amritsar. It remains true that the Force participated to the Operation; the troops even did some rehearsal at the SSF's Headquarters in Chakrata (Uttarakhand). I reproduce this article with the factual mistake. Another of my articles on the SFF, The Phantoms of Chittagong is posted on Rediff.com. Twenty years ago, India went through one of the most traumatic experiences of her modern history. Indira Gandhi, the then Prime Minister had to order the Indian army to assault the Akal Takht occupied by armed Sikh militants in the Golden Temple Complex at Amritsar. Several aspects of Operation Blue Star, as well as the sequence of events which brought the country and more particularly the state of Punjab, to this sad end have been described in detail by eminent writers. However, one aspect has never been mentioned. It remains one of the most secret features of this painful event: the participation of Tibetan commandos known as ‘Special Frontier Forces’ (SFF) in the military operations at the Golden Temple complex. Before going into the background of this intervention, it is necessary to point out the preposterousness of the situation. Armed militants had not only taken over the most sacred shrine of the Sikhs, but had also fortified many places near the main temple to such an extent that a siege could be sustained for several weeks. In the West, Operation Blue Star has often been misunderstood and depicted as an attack on the Sikh faith. This is wrong. A few months after the operation, while visiting Paris, I stood in front of the majestic Notre Dame Cathedral and visualized the weird situation. What would the French government have done if militants had barricaded the doors and windows of this masterpiece of architecture, most sacred for tens of millions of French Christians? France (or England if a similar episode had occurred in Westminster) would undoubtedly have taken the same decision as Indira Gandhi to recover the holy shrine by force. For such a purpose the best troops are its disposal would have been used. In reading the story which follows, this basic tenet should be kept in mind. The question is, why were Tibetans troops used during Operation Blue Star? Though it raises many other questions, the answer is simple: because the SFF were the best commandos available at that time, at least in Indira Gandhi’s mind. The story of these men started many years earlier. In 1950, Tibet was invaded by the Chinese People Liberation Army. During the following years, Beijing began what they called the process of ‘liberation’ of the Roof of the World. The eastern part of the Tibetan plateau, particularly the province of Kham adjoining China, suffered most from the forced ‘liberation’. But the local Khampas had the reputation of being the best and the most fearless soldiers in Asia since centuries. Alexandra David-Neel, the famous French explorer wrote in detail (often with admiration) about the gentleman-brigands of Kham. In the mid-fifties, the Khampas organized themselves to fight the Chinese occupiers. Under the name of Chushi Gangdruk (Four Rivers, Six Ranges) or National Volunteer Defense Army, the horsemen of Kham inflicted heavy casualties on the better equipped Liberation Army. In March 1959, a few hundred of them secretly accompanied the Dalai Lama to safety in India. 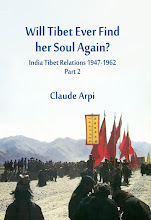 Once the Tibetan leader was given asylum by Delhi, the Tibetan soldiers were in a dilemma: should they stop their activities against the Communist troops and follow their religious leader to exile or continue the struggle for the liberation of their motherland? Forty five years later, it still remains difficult to follow their journey as they were all under oath to not disclose their new activities (in fact, it is only years later that they would learn themselves their own itinerary). From Darjeeling, they were smuggled through the East Pakistan border (now Bangladesh) with the connivance of Pakistani authorities. After a long journey in a sealed wagon and a car ride through East Pakistan, they were taken to an airport. Finally they boarded a small aircraft where for the first time they were addressed by white men who offered them a very strange blackish beverage. They would soon learn the name of this strange drink, Coca-cola. After a stop over in Okinawa (they believed they were in Taiwan), their journey continued. In the plane they received their first briefing and were given strange sounding names such as Doug, Bob, Willy, Jack, Rocky, Martin or Lee. Their suspicions were confirmed: the United States of America had finally decided to help the Tibetan cause and provide the necessary training to help them free their country. After Okinawa, they landed in a second island (Hawaii) and then a city (San Francisco). The next day they reached Camp Hale, a place located 100 km from Denver in Colorado which was used during World War II for high-altitude combat training. There, they received full commando training by the CIA. When the 1962 war with China broke out, India felt uncomfortable about the Tibetans being trained by the CIA. Delhi was particularly disturbed by the fact that it was organized with Pakistan knowledge. One week before Beijing declared a ceasefire, Delhi decided to act. On November 13, a clandestine Tibetan commando group was raised. The Special Frontier Forces were code-named as ‘Establishment 22’ simply because their first Inspector General had been the commander of 22 Mountain Regiment during World War II. Today, they still call themselves the ‘22s’ (twotwos). The Force was put under the direct supervision of the IB (and later the RAW). The first task of this entirely Tibetan force was to guard the Himalayan borders and eventually cross into Tibet to gather intelligence on the Chinese forces. Delhi had learned the hard way that China was not a ‘bhai’ and there was no short cut to reliable intelligence input on the Chinese in Tibet. B.N. Mulik, Nehru’s IB Chief was the main organizer of the new regiment and Maj Gen SS Uban of the Indian Army, its first Commander. Though aware of its existence, the Tibetan administration in exile dissociated itself from the venture. Violence was not acceptable to solve the Tibetan issue. But the commandos, trained by the CIA at Camp Yale, were the ideal human resource for the Indian purpose. As for the young Tibetans, they could finally dream of fighting ‘officially’ along with the Indian troops against the Communist forces and thus endeavour to regain one day their freedom. I have written earlier about the SSF involvement in the Bangladesh operations [link to the Phantoms of Chittagong]. After their outstanding participation in the liberation of Bangladesh, Indira Gandhi became enamoured with the SFF. It was soon nicknamed as “Indira Fauj”. But their role and actions have continued to be shrouded in mystery. Whether they served on the Siachen glacier or in counter-terrorism operations, the Tibetan troops never spoke. 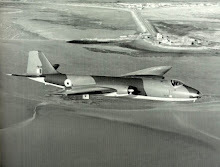 It is rumoured that in 1977 an AN12 aircraft was on constant alert at a SFF paratrooper base with instructions to fly the Prime Minister to Mauritius if her life was threatened. Whether it is true or not, very few can say! By the early 80’s, the SFF's Special Group had become the primary counter-terrorist force in India. It was therefore logical that Indira Gandhi was tempted to use the “22’s” for flushing the militants out of the Golden Temple Complex. Unfortunately, the military intelligence had very little clue to the extent of the fortifications in and around the Akal Takht. 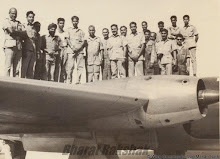 Once Operation Blue Star was decided, the SFF were flown from their base in UP and assigned the impossible task to isolate Akal Takht and secure its western flank by 1 am on June 6 while 1 Para-Commandos were to manage a foothold in the Akal Takht itself. What was in these young Tibetan’s minds at that precise moment? Were they still dreaming of a free Tibet or visualising the holy Tsuglakhang Temple in Lhasa vandalised by a so-called Liberation Army? At 2 am as the situation had not improved, the Army had no other alternative but to call for the tanks. It was done after the clearance was obtained from Delhi. The rest is history. During the following days, the ‘22’s’ continued to participate in the mopping up operations and it is said that one SFF officer, serving as President Zail Singh’s bodyguard when he visited the complex, was wounded in the arm by a sniper. The militant was immediately killed by other commandos. 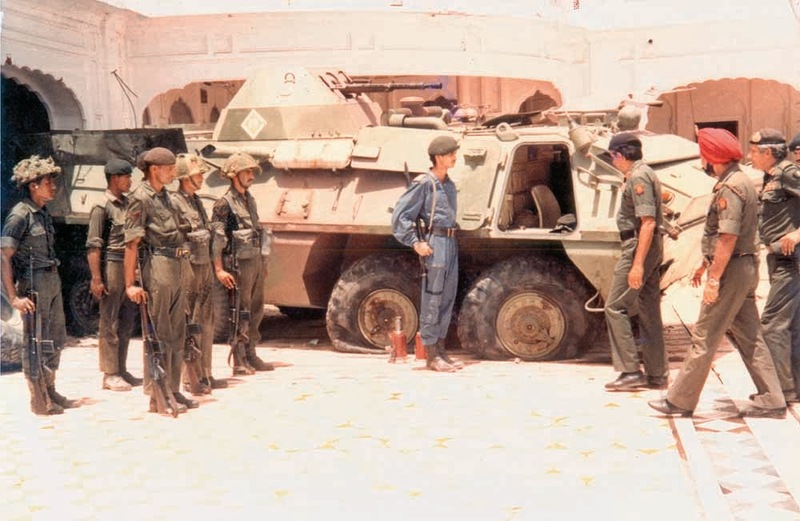 When Indira Gandhi was gunned down by her own bodyguards, Rajiv remembered his mother’s army and for a couple of months, the SFF provided the security to the new Prime Minister. A year later, a National Security Guard Act was created by an act of Parliament. The NSG would thereafter replace the Tibetan commandos. Their training and uniform were however modelled on the SFF. Such a strange destiny: ‘Establishment 22’, created to defend the Indian border (and for the Tibetans to liberate their country) was ultimately engaged in some of the most traumatic assignments in the history modern India. Not only did this have nothing to do with Tibet, but these men were unable to fulfil their own ultimate life mission: Tibet’s freedom. As consolation, they perhaps believed that they were repaying their debt to India who had given refuge to their leader. This way, they have probably created a good karma for themselves and for the future of their country! Who knows! 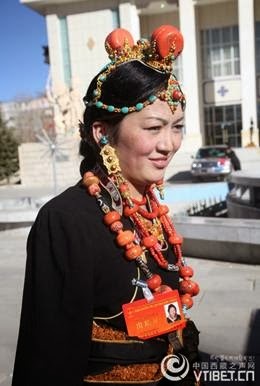 The annual Fashion Show has ended in Lhasa. 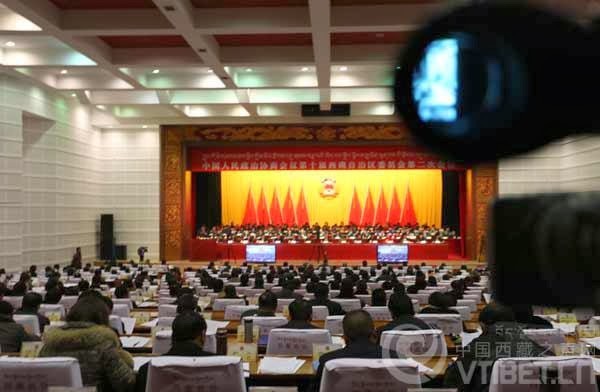 Xinhua announced that the 2nd session of 10th Tibet People's Congress was held on January 10, 2014 in the Tibetan capital. Some 388 deputies from the Tibetan Autonomous Region attended the session. 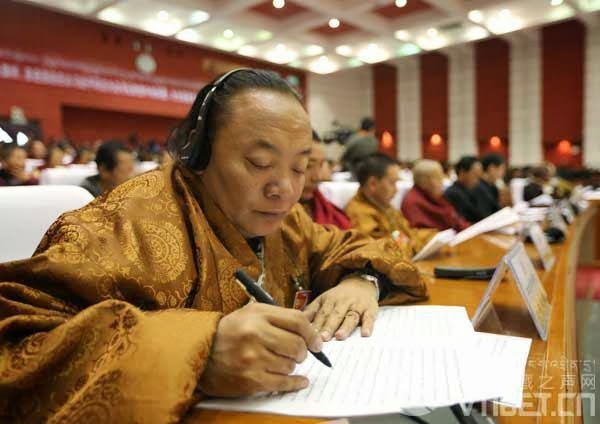 Padma Choling, (alias Pema Thinley), the chairman of the Standing Committee of the People's Congress of the Tibet Autonomous Region (TAR) spoke both in Chinese and Tibetan language. It was a re-apparition after several months out of media sight. It is Lobsang Gyatsen the Chairman of TAR who delivered the 'work report', in which the Party's 'achievements' for 2013 are listed. Undoubtedly, the major announcement was the the decision to continue the railway line to the Indian border of Arunachal Pradesh (Nyingchi Prefecture of the TAR). I have already mention it. A 117-km highway linking Medog, the last roadless county in China which formally opened to traffic on October 31, 2013. It cost 155 million U.S. dollars. [and comes dangerous close to the Indian border - my comment]. Tibet saw 13 million tourists, 400,000 more than the goal set at the year’s beginning and 20 percent more than in 2012; tourism revenue was 2.5 billion U.S. dollars [Tibet is a good business proposition - my comment]. Educational 'input' increased by 15%, with 3 secondary vocational schools and 209 kindergartens established and education subsidy standard raised. Lobsang Gyaltsen said: "The achievements were inspiring and uplifting." 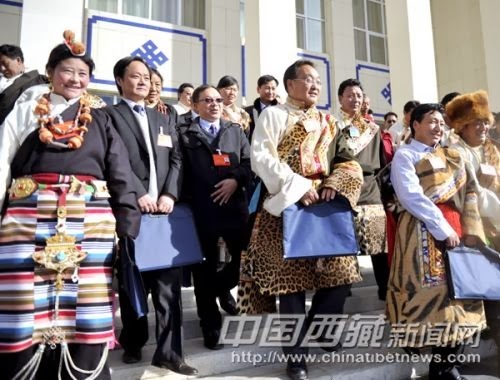 Xinhua added: "Deputies expressed that they will work hard, blazed new trails, and made new greater contributions to the leapfrog development in economy and society of Tibet." But the most important part of the annual performance was the Great Fashion Show put up by the deputies. Of course, the fur dress is not politically very correct, but a show is a show. River near Tawang: will it disappear? My article Development must be democratic too appeared today the Edit Page of The Pioneer. Everyone knows that India is an incredible country. It counts many world firsts in its tally — being the largest democracy is one of them; a party unknown a few months ago, being elected to represent the ‘common man’ of the capital city, is another one. However one particularity has been missed by the ever-vigilant breaking-news media: It is the first time in the history of governance that the Union Minister for Petroleum and Natural Gas has also assumed the role of environment watchdog, holding the portfolio of Environment and Forests. It is true that Bharat is one of the few countries where contraries meet and even work together. But how Mr Veerappa Moily will achieve this feat is another issue. Former Environment Minister Jayanthi Natarajan had walked on a tightrope. In her words, she was “caught in a tussle between industrial growth and green issues”. She felt like the Mridangam (a South Indian percussion instrument beaten on both sides), she had said as the industry was blaming ‘environment’ as the “single reason why the country has not been progressing at all”. Rumour has it that she was ‘sacked’ because she was not pushing files fast enough. This is not the case with the new Minister. Since he took over the Environment Ministry last month, Mr Moily has cleared projects worth Rs 1.5 lakh crore. That is a lot. Even South Korean giant Posco has finally got its environmental clearance to build a Rs 52,000 crore steel plant in Odisha. Mr Moily has given the green light to more than 70-80 projects and has said that “the remaining will be approved before month-end”. Replying to the Prime Minister who stated during his recent Press conference that there were bottlenecks preventing timely environment clearances for industrial projects, Mr Thakkar asserts that the Expert Appraisal Committee for River Valley and Hydro Electric Projects, appointed by NDA Government, on has not rejected a single project in the last seven years. Mr Thakkar concludes that decisions should be not only transparent and fair, but they also need to be “democratic, well-informed and professional”. The stakeholders, in other words the common man, needs to be taken into confidence. China too is facing a similar dilemma. According the to South China Morning Post: “While supporters often tout big dams as effective solutions to poverty and the country’s power shortages, critics have pointed to rampant environmental and geological hazards and simmering tensions over relocation disputes among those evicted to make way for dams.” The main issue is to find the right balance between the interests of the industrialists and the stakeholders who will live their entire lives with the negative environmental collaterals of the dams or mines. An organisation from Arunachal Pradesh, where a large number of hydropower plants are being planned by the Union Government, has recently revolted. Save Mon Region Federation, a group comprising Buddhist monks and activists, opposed the construction of 15 hydropower projects in the border district of Tawang in Arunachal Pradesh. The ‘planners’ in New Delhi counter that these plants will generate 3,500 MW power; it will be useful to the consumers and industrialists in the plains. On January 9, the SMRF submitted a memorandum to the Union Ministry of Environment and Forest. It said: “It is learnt that the Government has entered into 133 secret Memorandums of Understanding without following the mandatory procedures under the law with various power developers, maximum of which are private developers.” The SMRF also alleges that the hydropower companies are involved in “corruption and under the table dealings”. It further states that the MoUs in Tawang have been signed without taking the affected people’s consent. There is no doubt that most of the private developers have no technical knowledge about dams, but it is a good source of revenue for politicians starved after the disclosure of successive corruption scams such ‘Coalgate’. And let us not forget that elections are around the corner. The SMRF’s memorandum notes that Tawang is inhabited by the Monpas with a population of less than 3,500 persons. The influx of people that will be brought by the project “will change the demographic profile and wipe out their culture and tradition and make the Monpas a minority”. The SMRF has a point. But even more serious is the fact that the area is claimed by China. In such sensitive areas, New Delhi should not act as a colonial power imposing unwanted projects and alienating voters. The Monpas have also rightly asserted that the fragile Himalayan region is located in a high seismic zone and that “experts have advised against mega dams in the region”. Facing difficulties with locals, the Government in New Delhi has decided to export its technology to Bhutan which does have the legislation (and the strong democratic roots) to counter powerful lobbies. But here too, all is not rosy. Since July 2013, one part of the mega Punatsangchhu-I Hydroelectric Project started sinking. Huge rocks were found moving down towards the spot under excavation of the base of the dam. PHPA-I is the first stage of a joint India-Bhutan initiative started in May 2008 to generate 10,000 MW of hydropower by 2020. It appears that Bhutan is trading happiness for an uncertain ‘developed’ future. It is time for the Union Government to realise that ‘people’ exist too. New Delhi has to understand that in the case of conflict of interest, it can’t clear the files at top speed in a biased manner; otherwise, the Government (even if its coffers are full) will be taught the meaning of democracy during the next election. It remains an amazing fact that an Oil Minister can look after Environment. A New Cultural Revolution in the Offing? Chinese 'princelings' have started apologizing for their misdeeds during the Cultural Revolution. This is a movement probably orchestrated by President Xi Jinping, whose father Xi Zhingxun was so badly treated at the time of the Great Proletarian Cultural Revolution (in fact, even before, as he was 'purged' in September 1962). I couple of years ago, I posted on this blog The Fall of Xinjing's Father. You can also see another posting on the subject, Xi Jinping: a traumatic youth? It is a positive sign if Chen Xiaolu, the youngest son of People’s Liberation Army Marshal (and Foreign Minister) Chen Yi or Song Binbin, the daughter of Song Renqiong, one of the "Eight Immortals" now acknowledge their wrongdoings during these mad years. In a speech at the Great Hall of the People in Beijing to commemorate Mao's birth, Xi Jinping himself told his Party's colleagues: "Revolutionary leaders are men, but not gods. We should not worship them like gods." He however added: "but we should not negate them completely because they made mistakes. We should move forward, but can't forget the path that we have travelled." A first small step towards an official condemnation of the atrocities of the Cultural Revolution? But what about the atrocities committed in Tibet and elsewhere in China before and after the Cultural Revolution. Not only the Party has never apologize, but it continues with the old propaganda line. China Tibet Online reported: "On Jan.12, deputies to the Tibet People's Congress and members of the CPPCC [Chinese People's Political Consultative Conference] Tibet Committee elected through democratic elections gathered in Lhasa reviewing and discussing the local government work report of 2013. 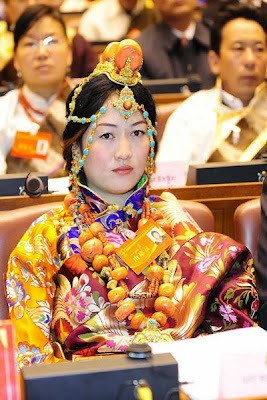 Majority of the over 1000 deputies and members are Tibetans, who are the role models and backbone of local government." A CPPCC delegate: role model or model? 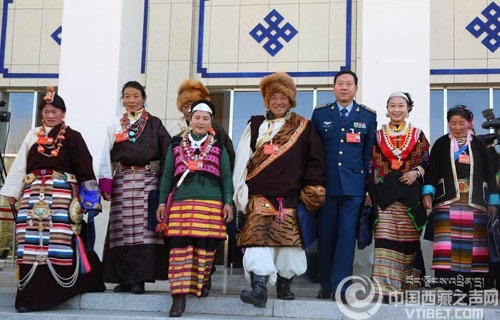 The article quoted one Tsedan Tashi, director of the Tibetology Research Institute of Tibet University: "The vast majority of Tibetan social elites are descendents of serfs, and they have become the 'leaders' of Tibet. 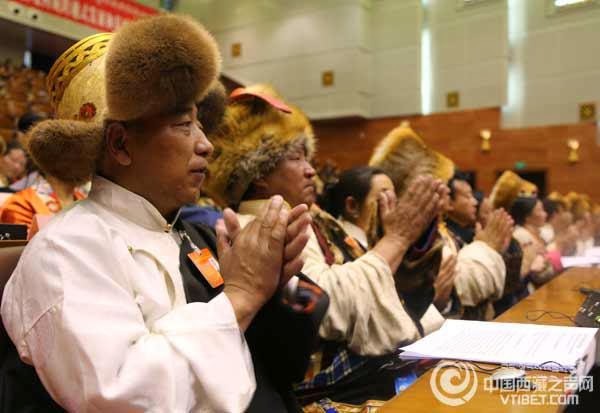 China Tibet Online affirms: "In October 2013, 25 of the party secretaries or director generals among the local 26 departments are Tibetans, and most of them are descendents of serfs. Before the democratic reform in 1959, Tibet was controlled by the slave-owning class consisted of officials, nobilities and senior monks. Slaves suffered harsh political oppression and economic exploitation." Tsedan Tashi said 95 per cent of people in Tibet are [were?] slaves, who inherit their 'identity' from generation to generation without any opportunity and channel to change their destiny: "under the protection of legal system and institutional guarantee, the offspring of serfs have become outstanding politicians, entrepreneurs, educators and doctors on the land that their ancestors can't change their fate no matter how hard they have once worked." It seems to me a language of the Cultural Revolution, and if the new leaders in Beijing are not careful and continue this type of divisive propaganda, another similar movement could be around the corner in the Middle Kingdom. Following a rare apology issued last year by Chen Xiaolu, the son of one of the Communist Party's founding generals, for his wrongdoings during the Cultural Revolution, the daughter of another Communist Party elder has also stepped up to express remorse for her connection to the death of her middle school principal 48 years ago. Song Binbin, 64, joined a group of her former classmates on Sunday to apologise to their teachers for their part in the political upheaval that ravaged China between 1966 and 1976, The Beijing News  said on Monday. Song’s father, Song Renqiong (1909-2005), was one of the Communist Party’s founding generals and a member of the "Eight Immortals", the most powerful elders in the Party's top echelon in the 1980s and 1990s. The younger Song, who was studying at a high school attached to Beijing Normal University at the time, became a symbolic figure in the frantic and often violent Red Guard movement after a meeting with Mao Zedong on top of the Tiananmen Rostrum in August 1966, where Mao encouraged Red Guards from around the nation to resort to violence in their "continued revolution". A photo published on The Beijing News on Monday shows Song and some of her former fellow classmates bowing in front of a statue of Bian Zhongyun, the party secretary and vice principal of the school at the time who was persecuted and brutally beaten to death by students two weeks before Song's historic meeting with Mao. 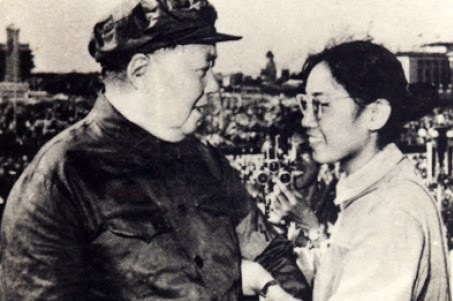 She was among the first of educators to be killed during the Cultural Revolution. “I would like to express my ongoing grief and apologies to Principal Bian. The inability to protect school leaders is my lifelong regret,” Song was cited saying to all her teachers and classmates. 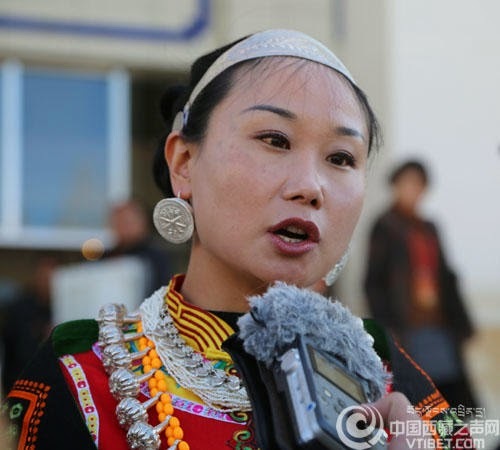 Song denied taking part in the brutal beatings that killed the vice principal, but apologised for not doing enough to stop the violence because she was afraid to be blamed for hindering the “criticising and denouncing efforts”. “I did not [intervene] and was unable to prevent the violence towards Principal Bian and other school officials,” she said. Song, who had lived in the US since the 1980s and moved back to Beijing in 2003, told The Beijing News that she hoped the students’ apologies could prompt public introspection over the events during the Cultural Revolution. “If we do not thoroughly understand and examine the mindset behind the entire Cultural Revolution era, similar incidents will happen again,” Song was quoted as saying. Other students who had participated in the violence also issued apologies to their late and surviving teachers. “[My teacher] is already over 90 years old, there isn’t much time left for an apology if I don't do it now,” said Wang Simei, who was also a student in 1966. In the past few years, a number of people who were student Red Guards during the Cultural Revolution have made belated public apologies to their former victims. The most prominent figure among them was Chen Xiaolu, the youngest son of People’s Liberation Army Marshal Chen Yi. A Red Guard leader during the Cultural Revolution, Chen first published a written apology online, and then expressed his remorse in person to his former teachers. The high-profile moves garnered national attention and triggered heated discussions online. 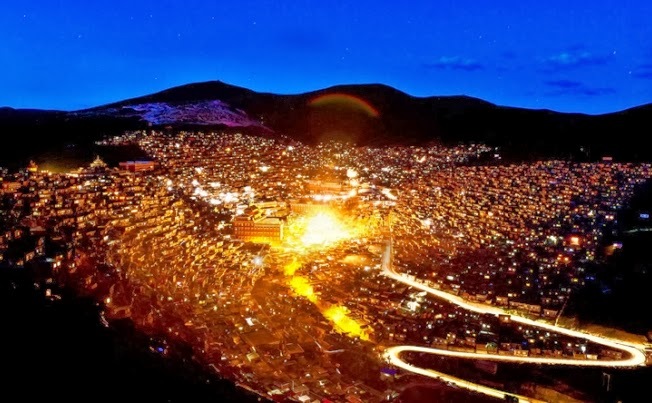 First, we heard of a huge fire breaking out at the Serthar Tibetan Buddhist Institute (known Seda Larung Wuming in China) in the Kartse (Garzi) Tibetan Autonomous Prefecture of Sichuan Province. The fire was reported at 7.30 pm on January 10. Serthar, is said to be the largest Buddhist institute in the world with 10,000 nuns and monks (in an earlier posting on Serthar, A 'spiritual' revival in China or another gimmick? I quote some sources speaking of 40,000 monks and nuns). Then, images of a new fire, also in Tibet (but in the neighbouring Yunnan province) appeared in the media; the fire is said to have engulfed 200 'traditional' houses in Dechen county. About the first one, The South China Morning Post reported: "The blaze destroyed more than a dozen buildings, which some reports said were living quarters for student monks or nuns. No casualties have been reported as yet. Authorities are still investigating the cause of the fire, according to initial reports on microblogging platform Sina Weibo." It is said that some 450 people joined the rescue operations. Weibo showed people in uniforms as well as monks walking through the debris with the fire raging in the background. These 2 fires have something in common. They represent 'New Tibet' (or Tibet with Chinese characteristics). In a posting earlier this month, I speak of the 'spiritualization' of the Chinese society (see The Year of the Horse: a Prediction). The Serthar Institute is the main example of this 'spiritual' search, with thousands of Chinese joining Larung Gar as a monks or nuns. The other aspect of 'New Tibet' is what I have called the Disneyfication of the Land of Snows: 14 millions Han tourists in the Tibetan Autonomous alone! Shangri-la, a place where the majority people believe in Tibetan Buddhism, is full of religious atmosphere amid the sutra streamers everywhere.Shangri-la has an area of 11,613 square kilometers populated with near 130,000 people who are mainly Tibetans. The prevalent religion is Tibetan Buddhism believed by not only Tibetans but also people of the Naxi, Yi and Bai ethnic groups. Shangri-la is one of the main sites on the plateau for 'Tibet tourism' where hundreds of thousands of Chinese visitors rush every year in search of some exoticism. A touch of spirituality was even added with the very name 'Shangri-la'. Why should these two symbolic sites of 'New Tibet' burn at the same time? Incidentally, a Communist cadre who served in the two 'burning' places in Eastern Tibet (in Kartse in 1995-96 and Aba in 1996-2000) has been sacked. He was close to the former security tsar Zhou Yongkang. Li has got the boot after being suspected of corruption, according to the Chinese media. It is the latest move against people close to Zhou, himself under graft investigation. Xinhua has announced that Li had been removed from his post as head of an advisory body to the legislature in the southwestern province of Sichuan for suspected severe violations of discipline: "Authorities are investigating his case according to procedure,” Xinhua added, citing a statement from the Communist Party’s powerful Organization Department. Li Chongxi was the chairman of the provincial committee of the Chinese People's Political Consultative Conference. He is the third senior Sichuan official to fall under suspicion in 2013. This has no connection with the fires. One more story about 'fire'. The great Indian Guru Padmasambhava is said to have been able to set on fire the robe of the Chinese Emperor, just by reciting powerful mantras. Again no connection with the Serthar and Shangri-la fires, though both these mishaps have been 'miraculous', in the sense that there was no casualty. Authorities in Dukezong, the Tibetan town in Yunnan province that was largely destroyed in a fire over the weekend, said it was unlikely the blaze was started deliberately. The possibility of arson has been mostly ruled out but an investigation was still under way, Xinhua reported. Some people living in the town in Shangri-la county, which is about 1,300 years old, have questioned the speed of the response of emergency services. A 30-year-old woman, who gave her surname as Wang, said that when she arrived at the scene of the blaze at 3am on Saturday, more than an hour after the fire had started, there were only two fire engines in the area. They had not begun spraying water on the flames, she said. Other residents said firefighters arrived 30 minutes after the blaze broke out. Chen Tianchang, a fire captain, told Xinhua that firefighters were at the scene in five minutes but that there were delays in tackling the blaze. He said the old town did not have any firefighting equipment until several years ago and that water pipes were built above ground so as not to damage the town's historic character. "To avoid water in the pipes freezing and breaking them, no water was stored in them. So it took time to fill them with water," he said. Wang said: "I'm not sure why, but they only began hosing the fire about 15 minutes after I arrived, that's about 11/2 hours after the fire had broken out … Nothing is left. Luckily nobody was hurt. The old town will never be the same again." A building she owned, which had been let out as a cafe and bar, was destroyed in the blaze. She said her losses could well run into millions of yuan. No injuries were reported in the blaze, but at least 2,600 people were evacuated from three neighbourhoods of the town with cobbled streets. At least 240 buildings burned down, affecting 335 households. Cultural relics and Tibetan art works were destroyed. The cost of the damage was initially put at more than 100 million yuan (HK$128 million). The fire broke out at 1.30am on Saturday morning and took just under 10 hours to bring under control, Xinhua reported. 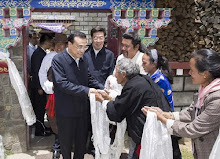 Most of the houses were made of wood and the windy weather made the fire spread quickly, Zhang Zhijun, deputy chief of Deqen Tibetan autonomous prefecture, was quoted by Xinhua as saying. "About 2,000 professionals were deployed to fight the fire, which was burning wildly and causing chaos," he said. "The fact that nobody was hurt shows the way it's handled was scientific." Chen Limei, who works at a hotel 500 metres from the blaze, said that because tourists would probably avoid the area, some hostels were allowing homeless residents to stay for free. "It's really cold out there so people need help," she said. All is not well with the PLA? New Roads to Tibet for 2014?